If you don't count Tomas Berdych, unseeded Oliver Golding is the toast of Wimbledon today, after coming from behind to upset No. 1 seed Jason Kubler of Australia 4-6, 6-3, 7-5 in the third round of the boys championships. Golding, who will be 17 in September, broke Kubler at 5-5 and faced the difficult task of serving it out in front of what was undoubtedly a SRO crowd of supporters on Court 14. Listening to Radio Wimbledon's Robbie Koenig, I could tell that Golding wasn't rushing the moment, and his serve really came through for him when he needed it. For Kubler, it was his third straight early exit at a junior slam; he has yet to reach a quarterfinal. As if that wasn't enough excitement on Court 14, doubles partners Sloane Stephens and Timea Babos, who won the French girls title earlier this month, followed with a scintillating match that Stephens won 6-2, 3-6, 8-6. Down two breaks at 2-5 in the third set, the unseeded Stephens saved two match points on Babos's serve, held at love, and with Babos serving for the match the second time at 5-4, broke at 30-40 to even it. Babos managed to stop the slide by holding for 6-6, but serving at 6-7, the third-seeded Hungarian was broken for the third time in four service games, again at 30-40, to give Stephens the victory. It is her second trip to the Wimbledon junior quarterfinals, and she will play No. 9 seed and Roehampton champion Kristyna Pliskova of the Czech Republic, who dismissed wild card Eleanor Dean of Great Britain 6-0, 6-2. For more on the Babos - Stephens match from someone who was there, see the wimbledon.org article. Grace Min lost to No. 15 seed Yulia Putintseva of Russia 7-5, 6-0, and No. 5 seed Monica Puig lost to No. 12 seed and doubles partner Ons Jabeur of Tunisia 6-3, 6-3, despite leading 3-1 in the second set. Jabeur was a finalist at Roland Garros earlier this month. Not only do the British have Golding to follow in the quarters, but they are assured of a girls semifinalist, as No. 8 seed Laura Robson and unseeded wild card Tara Moore will meet to decide who will advance. Moore ended the run of qualifier Nigina Abduraimova of Uzbekistan 6-1, 6-3, while Robson needed close to two hours to beat back the challenge of No. 11 seed An-Sophie Mestach of Belgium 6-4, 7-6(2). For more on the British junior success and Wimbledon, see this article from the BBC. Denis Kudla, the No. 7 seed, avoided the upset bug that struck both Kubler and Australian Open boys champion and No. 3 seed Tiago Fernandes of Brazil, who lost to qualifier Ben Mitchell of Australia 7-5, 6-4. Kudla overcame Ben Wagland of Australia 6-3, 7-6(2), not letting the five break points that Wagland saved serving at 5-5 in the second set disrupt his concentration. In the quarterfinals, Kudla will play Roehampton finalist Facundo Arguello of Argentina, who beat Filip Horansky of Slovakia 7-5, 3-6, 7-5 in a contest between two unseeded boys. For complete draws, including doubles, which are only now finishing the first round, can be found at wimbledon.org. I'm telling a lot of kids to back off, that they are on the court too much and not doing other stuff to keep their mind clearer. It's also important at early ages to allow your general athleticism to develop. This Wimbledon has been full of surprises for the past nine days, and the juniors are doing their part to keep the unexpected results coming. Fourteen-year-old wild card Eleanor Dean of Great Britain has leapt into the spotlight with wins over No. 7 seed Gabriela Dabrowski of Canada in the first round Saturday and impressive 6-4, 0-6, 6-4 win over Ksenia Kirillova of Russia today. Dean lost ten straight games, falling behind 4-0 in the final set, but doing her best Petra Kvitova impression, she won the final six games of the match. Not surprisingly, she received a feature story on wimbledon.org. Another player making a name for herself at Wimbledon is qualifier Nigina Abduraimova of Uzbekistan, who turns 16 next week. Ranked inside the top 500 by the WTA, Aburaimova has played almost exclusively in her home country or in Asia, and Wimbledon is her first junior slam, but today she made it especially memorable, taking a 6-2, 4-6, 6-3 decision from No. 4 seed and Australian Open girls champion Karolina Pliskova of the Czech Republic. No. 6 seed Nastja Kolar of Slovenia was also eliminated today, with Denisa Allertova of the Czech Republic earning a 6-2, 4-6, 6-3 win. Grace Min of the U.S. successfully followed up on her first round win over No. 1 Elina Svitolina by taking out Polina Pekhova of Belarus 7-5, 7-5. She is joined in the third round by Monica Puig, the No. 5 seed, who came back for the second time this tournament, recording a 1-6, 6-3, 6-4 win over wild card Francesca Stephenson of Great Britain. Sloane Stephens beat No. 16 seed Daria Gavrilova 6-0, 6-4 to set up an intriguing match against No. 3 seed and doubles partner Timea Babos of Hungary. Ester Goldfeld lost 6-4, 6-4 to Clothilde de Bernardi of France, the other qualifier in the last 16. Qualifier Krista Hardebeck lost to No. 8 seed Laura Robson 6-0, 6-4, despite leading 4-2 in the second set. Mitchell Frank lost to No. 5 seed Jiri Vesely of the Czech Republic 6-2, 6-7(9), 6-4; qualifier Dane Webb fell to No. 3 seed Tiago Fernandes of Brazil 6-3, 6-1, and Raymond Sarmiento was beaten by No. 8 seed James Duckworth of Australia 6-3, 7-5. The Australian boys are one of the stories of the junior tournament so far, as four have reached the final 16. In addition to Duckworth, top seed Jason Kubler, qualifier Ben Mitchell and Ben Wagland won today. Wagland is Kudla's opponent in Wednesday's third round match. The British are also pleased with their showing, having five players--two boys and three girls--in the third round. According to this story on the LTA website, it is the country's best performance at Wimbledon in ten years. For more from today's action, see the ITF junior website article, which features comments from Sloane Stephens. For more on the boys 18s final, see this story from Eric Boal at the Los Angeles Daily News. For a look at the girls 18s final match, see this article from the Daily Pilot. For complete draws, see the TennisLink site. Another Roland Garros junior champion lost in first round action today at Wimbledon, with boys French champion Agustin Velotti, a wild card and the No. 2 seed, falling to fellow wild card and Roehampton winner James Marsalek of Great Britain 6-3, 6-2. With top seed Elina Svitolina's loss to Grace Min on Saturday, both boys and girls French champions are out in the first round. Monday saw the first action for the qualifiers, and more than half of the eight boys and eight girls who got through qualifying also won their opening match today. Among them were Dane Webb and Krista Hardebeck of the U.S., who had straight set wins over unseeded opponents in the first round, but will face stiffer tests on Tuesday. Webb will play No. 3 seed and reigning Australian Open champion Tiago Fernandes of Brazil, while Hardebeck will take on No. 8 seed Laura Robson, the 2008 Wimbledon girls champion, who beat Riza Ozaki of Japan 6-0, 6-1 today. The Robson - Hardebeck match is scheduled second on court 12, after the Denis Kudla and Liam Broady contest, and those matches may be available on live streaming for those of you who have ESPN 3. Qualifier Mikelis Libietis of Latvia took out No. 4 seed Duilio Beretta of Peru 6-3, 2-6, 15-13, but that wasn't the longest match of the day. That honor went to the match between No. 16 seed Kevin Krawietz of Germany and lucky loser Mitchell Krueger of the U.S. It was 16-14 in the final set before Krawietz escaped with a win over the 16-year-old Texan. Krueger took the place of Victor Baluda of Russia, who was known to be having visa problems, and won the first set 6-3. Krawietz came back to take the second by the same score, with each set taking less than a half hour. Things changed in the third set, although when Krueger was broken serving at 7-7, it didn't look as if the ending would be all that unusual. But Krawietz never got to match point, with Krueger breaking back at 30-40 to make it 8-8. Krueger was in trouble his last four service games, needing to save a break point at 30-40 in all four of those games, and remarkably, doing so. But in the fourth, at 14-14, Krawietz got a second break point, which he had not done in the previous three service games of Krueger, and this time he converted. There would be no second miracle for Krueger, when Krawietz held to complete the 103-minute third set. I want to make clear that I am NOT at Wimbledon, and all the above information comes from the live scoring on wimbledon.org. If I am at a tournament, you will see a byline with the name of the city that I'm in. Sloane Stephens won her opening round match today, but Chanelle Van Nguyen was beaten by No. 4 seed and reigning Australian Open girls champion Karolina Pliskova of the Czech Republic. Junior Ore had two set points in the first set of his match with No. 13 seed Marton Fucsovics of Hungary but didn't seize that opportunity and lost 7-6(3), 6-4. In all there are nine U.S. players through to the second round. In addition to the upsets of Velotti and Beretta, two other boys seeds were eliminated today. Ben Wagland of Australia beat No. 10 seed Dominic Thiem of Austria and Facundo Arguello of Argentina took out No. 15 seed Roberto Quiroz of Ecuador. Only two seeded girls lost today, with Roehampton finalist Tara Moore, a British wild card, beating No. 14 seed Sophia Kovalets of Ukraine and qualifier Clothilde De Bernardi of France defeating No. 13 seed Veronica Cepede Royg of Paraguay. For more on Monday's action, see the ITF junior website and wimbledon.org. Fifteen-year-old Madison Keys won her first professional title on Sunday, the $10,000 Pro Circuit event in Cleveland, Ohio. Keys, who has no ranking due to limited play in professional events, defeated No. 3 seed Piia Suomalainen of Finland 6-2, 6-4 in the final. Tennessee graduate Caitlin Whoriskey captured her second straight pro title, teaming this week with Sanaz Marand, the recent North Carolina graduate, to record a 6-4, 6-0 win over Syracuse teammates Eleanor Peters and Emily Harman. The unseeded Whoriskey and Marand did not need a match tiebreaker in any of their four victories. At the $50,000 Women's Pro Circuit event in Boston, eighth seed Jamie Hampton collected her second title of the year by defeating top seed Madison Brengle 6-2, 6-1 and is poised to break into the top 200. The doubles title went to No. 4 seeds Kimberly Couts and Tetiana Luzhanska who beat top seeds Lindsay Lee-Waters and Megan Moulton-Levy 6-4, 3-6, 10-8. For complete results, see the Pro Circuit results page at usta.com. The final two contenders for the National US Open Playoffs were determined yesterday, when the Texas section completed its tournament. Former top 100 pro Alina Jidkova of Russia and current Texas A & M player Colin Hoover will join 30 other men and women next month at national tournaments in Atlanta (men) and Stanford (women) to decide who will receive a qualifying wild card into this year's U.S. Open. Recent sectional winners include juniors Courtney Dolehide, who won the Northern section, Jessica Pegula, who won the Intermountain section, and Belinda Niu, who won the Pacific Northwest section. For a complete list of the winners, see usopen.org. For more on the Texas section's tournament, click here. In college news, the NCAA announced that Kalamazoo College will play host to the men's and women's Division III championships in 2013. I'm not sure whether this combined event is a revival or a new concept, but the past several years the men's and women's championships have been at different sites. If my calendar is correct, the dates will be May 21-26. I will be covering the Division I tournament at Illinois, I think, but it's exciting to have another big tennis event here in Kalamazoo. 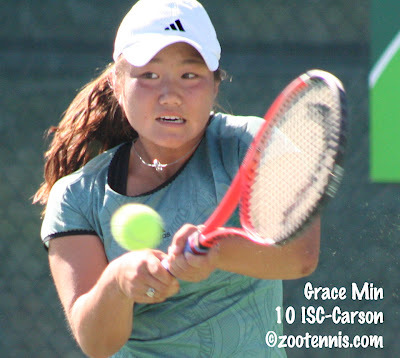 The big story in the Wimbledon Junior Championships came early today, with Grace Min of the U.S. taking out No. 1 seed and 2010 Roland Garros girls champion Elina Svitolina of Ukraine 2-6, 7-5, 6-3. For more on the match, see the story on the Wimbledon website, which sees a resemblance that I don't when describing Min. Other U.S. girls who advanced to the second round are Ester Goldfeld, who beat wild card Katy Dunne of Great Britain 6-4, 6-2 and No. 5 seed Monica Puig, who posted a tough comeback win over 19th ranked but unseeded Cristina Dinu of Romania 3-6, 6-3, 6-4. Lucky loser Lauren Herring fell to Doroteja Eric of Serbia 1-6, 7-5, 6-1. The only other seed to fall on Saturday in either the boys or girls draw was No. 7 seed Gabriela Dabrowski of Canada, who lost to British wild card Eleanor Dean 3-6, 6-0, 6-0. Stephanie Myles of the Montreal Gazette is at Wimbledon and has more about Dabrowski's struggles this summer in this article. The U.S. boys went 3-2 on Saturday, with Denis Kudla(7), Mitchell Frank and Raymond Sarmiento winning in straight sets. 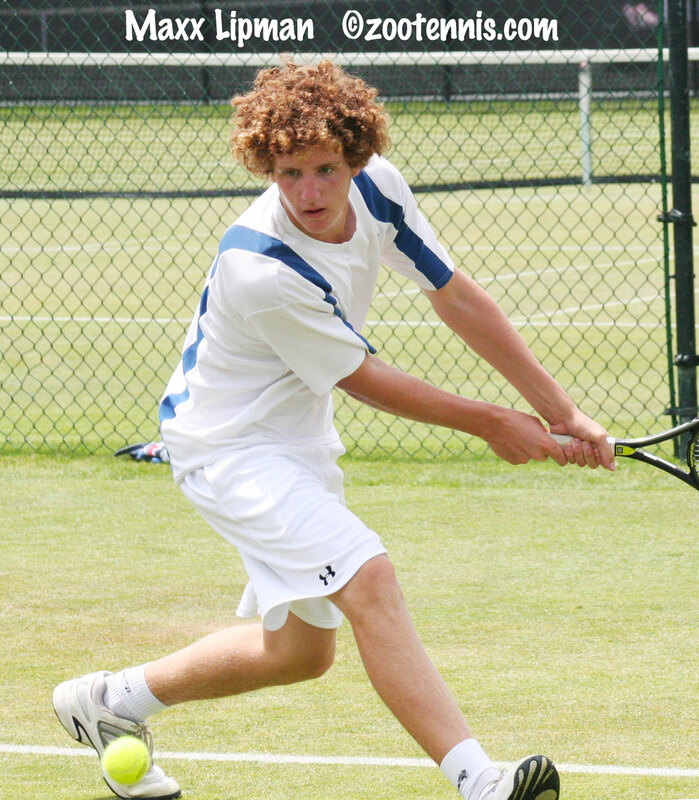 Kudla defeated Ben McLachlan of New Zealand 6-1, 6-4, and there is a brief story on the match on the Wimbledon site and more on Kudla's preparations for a deep run can be found at the ITF junior site. Sarmiento beat British wild card Kyle Edmund 6-4, 6-4 and Frank downed Jeson Patrombon of the Philippines 6-1, 7-5. Dennis Novikov lost to Oliver Golding of Great Britain 6-4, 6-2 and Nick Chappell was beaten by Justin Eleveld of the Netherlands 6-2, 6-4. The remaining 31 first round singles matches are on Monday's schedule, which can be found here. Arguably the biggest upset of the tournament was recorded today in the second round of men's doubles, when two-time defending Wimbledon champions Daniel Nestor of Canada and Nenad Zimonjic of Serbia were beaten by British wild cards Dom Inglot and Chris Eaton 7-5, 5-7, 7-6(4), 6-7(3), 8-6. Inglot, who won the 2009 NCAA doubles title with Michael Shabaz as a senior at Virginia, has been playing with Eaton regularly the past year. For more on that match see the Wimbledon website article. Ken Skupski, the former LSU All-American, has reached the second round of the men's doubles with partner Colin Fleming, after the pair defeated the French team of Arnaud Clement and recent hero Nicolas Mahut 7-6(4), 6-4, 3-6, 7-6(4) today in a match delayed due to the marathon match between Mahut and John Isner. Skupski and Fleming will play the Bryan twins in the second round. 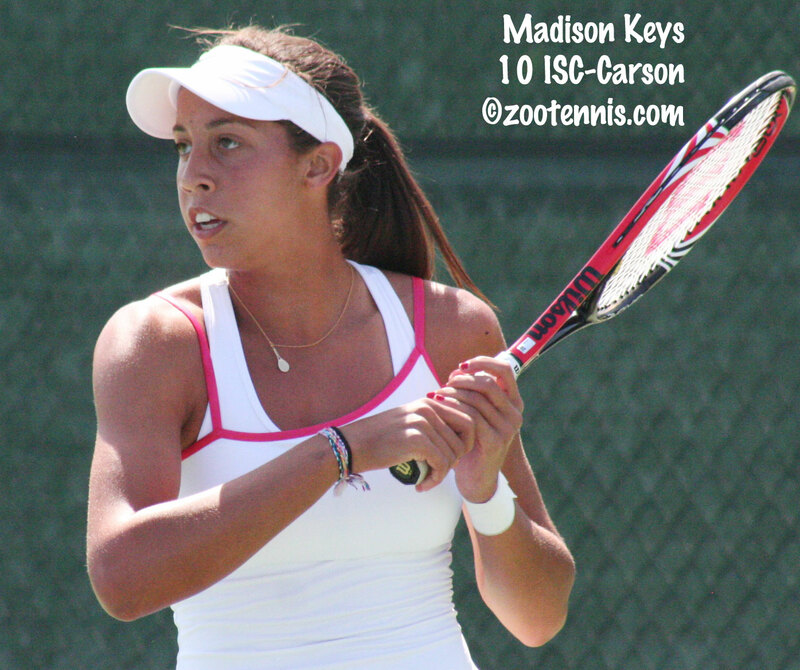 In the $10,000 Pro Circuit tournament in Cleveland, unseeded Madison Keys has reached Sunday's final after a 6-3, 6-4 victory over 2008 US Open girls finalist Gabriela Paz of Venezuela. After a three-set win over Kaitlyn Christian in the first round, Keys has been cruising. The 15-year-old from Florida will play No. 3 seed Piia Suomalainen of Finland in the final, Keys' first as a professional. Caitlin Whoriskey and Sanaz Marand will play Eleanor Peters and Emily Harman for the doubles title Sunday. Lauren Davis was originally scheduled to play in the Cleveland event, but was held out due to an injury. For more on Davis and her recent move to the Evert Academy, see this News Herald article. For complete results, see the Pro Circuit page. Qualifying for the Wimbledon Junior Championships is complete, and play begins on Saturday with Americans Dane Webb and Krista Hardebeck joining a dozen other Americans in the main draw. Lauren Herring also will be playing at the All-England Lawn Tennis Club, gaining entry into the main draw as a lucky loser. There are 33 junior matches on the Wimbledon schedule for Saturday, with nine of the 14 U.S. players in action. Raymond Sarmiento, Dennis Novikov, Mitchell Frank, Nick Chappell and Denis Kudla, the No. 7 seed, are the U.S. boys taking the court Saturday. Webb and Junior Ore will not play until Monday, with Sunday the traditional day off for everyone, pros and juniors alike. The U.S. girls competing on Saturday are Herring, Ester Goldfeld, Grace Min and Monica Puig, the No. 5 seed. Hardebeck, Chanelle Van Nguyen and Sloane Stephens are not on Saturday's schedule. The draws released late this afternoon contained a couple of big surprises, with Laura Robson of Great Britain and Agustin Velotti of Argentina receiving wild cards. Robson, who lost in the first round of women's singles, women's doubles and mixed was probably a last-minute decision; I'm not sure why Velotti would have been in need of a wild card. Perhaps, like Daniel Berta and Gianni Mina (neither of whom are in the draw at Wimbledon) in the Australian Juniors this year, he simply neglected to enter by the deadline. In any case, he is in and seeded No. 2, while Robson is the No. 8 seed. Velotti plays a fellow wild card in the first round Monday, but it can hardly be called a good draw, as he will face James Marsalek of Great Britain, who won Roehampton today. Kristyna Pliskova of the Czech Republic was the girls singles winner. For more on the Roehampton finals, see the LTA website. The ITF Junior website has this preview, and my preview for the New York Times Straight Sets blog can be found here. The University of Illinois announced today that it has been selected to host the 2013 NCAA Men's and Women's Division I Tennis Championships. For more, see the Illinois athletic site. As I mentioned yesterday, another of my question and answer sessions with a Division I college coach, this time Peter Smith of USC, is now available at the Tennis Recruiting Network. These conversations have provided me with so much more insight into the college game than I had before, and I thank several readers of this site for encouraging me to undertake them. Of course the real gratitude goes to the coaches themselves, who have agreed to take the time to talk with me and have been expansive and candid in their answers to my questions. As I'm sure you've heard by now, John Isner won the longest tennis match in history today, defeating Nicolas Mahut 70-68 at Wimbledon. In the press conference after, which was shown on ESPN2 (although not in its entirety), Isner was asked about his focus and composure. He credited, as he has in other interviews over the years, college tennis in general and his coach at Georgia, Manny Diaz in particular, for his ability to stay calm under pressure. For more on the entire match and the 20 games played today, see this New York Times story by Greg Bishop. For the British perspective, see this story from the Telegraph. The qualifying began at Roehampton today for the Wimbledon Junior championships. It will conclude Friday, with main draw play beginning on Saturday. There are three U.S. boys in qualifying, all from Texas: Dane Webb(3), Shane Vinsant(9) and Mitchell Krueger(13), and they all advanced in straight sets to the second and last round of qualifying. Both U.S. girls in the qualifying, Krista Hardebeck(5) and Lauren Herring(15) also won in Thursday's play. Grace Min was still listed as a qualifier in the latest update, but she does not appear in the draw, so I'm assuming she was promoted to the main draw due to some last-minute withdrawals. The other U.S. girls in the main draw are Chanelle Van Nguyen, Sloane Stephens and Ester Goldfeld. The U.S. boys scheduled to compete in the main draw are: Denis Kudla, Mitchell Frank, Raymond Sarmiento, Junior Ore, Nick Chappell and Dennis Novikov. The qualifying draw and results are available at the ITF junior website. At Roehampton, Sarmiento and Hardebeck lost in the singles quarterfinals on Wednesday, as did Min and Herring in the girls doubles. The Roehampton finals feature two unseeded British players, with wild card Tara Moore contesting the girls final and qualifier James Marsalek playing in the boys final. Moore will face No. 7 seed Kristyna Pliskova of the Czech Republic, while Marsalek will meet unseeded Facundo Arguello of Argentina, who was also a finalist at Roehampton in 2009, losing to Devin Britton in a third set tiebreaker. For more on the Roehampton tournament, see this article. Apologies to all the others out there playing today, but there's only one story today in tennis. I had put the finishing touches on my interview with University of Southern California's Peter Smith, which will appear Thursday at the Tennis Recruiting Network, so I was planning to watch some of perhaps Roddick's match today, catch the USA's World Cup match, and then run some errands. I was interested in the end of the John Isner-Nicolas Mahut first round match, so I checked on that at wimbledon.org and it was at 2-2. I went to espn3 and sure enough, it was available, even though it was court 18, so I began to watch it on my computer. Nearly seven hours later, with a few hours of play viewed on ESPN 2 rather that my laptop, I was still watching, and the first round match, which was called due to darkness on Tuesday, was again suspended with the score 59-59 in the final set Wednesday. Isner had held 59 straight times and faced only two break points in that stretch; Mahut was serving from behind the entire time and yet he only faced four match points. A couple of double faults seemed to suggest that he might crack, but his serve always came through when he needed it. Mahut, who had won a second qualifying match 24-22 in the third this year and came back to play the next day, looked incredibly energetic even toward the end, with the occasional dive for balls. Neither player took a bathroom break until 58-all, and the chair umpire never did. You couldn't help but laugh when he would say the score-"game Isner, he leads 53-52." I saw Denis Kudla and his coach Frank Salazar seated near the baseline right to the end, and I'm sure it's an afternoon/evening at Wimbledon that neither will ever forget. The question that occurred to me as the games improbably piled up, one after another, was this more impressive for physical or mental reasons? I think it was Vince Lombardi who once said fatigue makes cowards of us all, and yet, though no one could ever expect a player to be fit enough to play 118 games in a day, neither Mahut nor Isner seemed to shrink from the big moments in the match. It's really hard to comprehend maintaining focus, technique, desire for that length of time. I wasn't there, and it's a match I'll never forget. How will it end? Will the winner be in any condition to continue playing the tournament? It hardly seems to matter right now. I can just marvel at what two men were able to find within themselves today. I hope every junior in the world was watching them. For a recap of all the tennis records broken in this match, see this story from the BBC. Farah, Falconi Named College Players of the Year; Wimbledon, Roehampton Update; Is Martina Hingis the Last of the Teen Phenoms? The Intercollegiate Tennis Association announced its ITA/Campbell Players of the Year today, with senior Robert Farah of USC and sophomore Irina Falconi of Georgia Tech receiving the 2010 honors. Both finished atop the final ITA/Campbell rankings. Doubles teams of the year are Caitlin Whoriskey and Natalie Pluskota of Tennessee and Henrique Cunha and Reid Carleton of Duke, who also finished No. 1 in the rankings. They will be honored at the ITF Hall of Fame Induction ceremony in Newport, RI on July 10th. The ITA website has more on the singles winners, including reactions from Falconi and Farah. On the grass of Southwest London today, US Open girls champion Heather Watson, who received a wild card into the women's draw, was beaten by qualifier Romina Oprandi of Italy 6-4, 1-6, 6-3. With Watson's and Anne Keothavong's losses today, following those of four other British women yesterday, there is no woman from Great Britain into the second round. U.S. players went 3-4 on Tuesday, with Vania King and John Isner all even with their opponents when darkness forced suspension of play. For complete results, see wimbledon.org. At the ITF Grade 1 in Roehampton, the British juniors actually outnumber the Americans as the tournament moves to the quarterfinals. Qualifier James Marsalek and unseeded Oliver Golding have advanced in the boys singles draw, as has unseeded Tara Moore in the girls draw. The only U.S. boys remaining in either singles or doubles is No. 16 seed Raymond Sarmiento, who defeated unseeded Mathias Bourgue of France 6-4, 6-0 today. Mitchell Frank, seeded 11th, lost to No. 7 seed Mate Zsiga of Hungary 6-4, 6-4 and Denis Kudla, seeded fifth, retired against Justin Eleveld of the Netherlands trailing 6-1, 0-1. Kudla and Sarmiento's opponents were given a walkover in doubles, so I assume a Kudla injury was the reason. The lone U.S. girl remaining in singles is unseeded Krista Hardebeck, who defeated unseeded Russian Ksenia Kirillova 7-6(6), 6-1 in Tuesday's third round. Top seed Irina Khromacheva of Russia was upset by No. 15 seed Chantal Skamlova of Slovakia 7-6(4), 6-3. Interesting that Khromacheva and French girls champion Elina Svitolina of Ukraine, who won the Grade 2 tournament in Halle last week, have exactly the same number of points, 975, which tops the girls world rankings. Svitolina claims the No. 1 ranking however, by virtue of having more Grade A points, which is the tiebreaker. Grace Min and Lauren Herring advanced to the quarterfinals in doubles. For complete draws, see the LTA website. Tom Perotta, writing for the Wall Street Journal, investigates the impact the WTA age restrictions have had on the age of women's Grand Slam champions. While I don't agree with his contention that women's tennis suffers when there is a dearth of teen superstars, the article does make a persuasive case that we will be seeing fewer and fewer of them in the coming years. Thanks to ESPN3, I was able to watch the live streaming of American Mardy Fish vs. Australian Bernard Tomic's in their first round match at Wimbledon, not expecting that the Roger Federer and Alejandro Falla contest would offer much drama. Although the 17-year-old qualifier held a set point in the second set tiebreaker, Fish's serve was too much for Tomic, and Fish went on to claim a 6-3, 7-6(8), 6-2 win, hitting 25 aces in just three sets. I didn't watch any of 2008 Wimbledon girls champion Laura Robson's match with No. 4 seed Jelena Jankovic of Serbia, but she too fell in straight sets, although according to this story at wimbledon.org, Robson played very well in the second set of her 6-3, 7-6(5) loss. Overall, U.S. players went 8-6 on the opening day of play, with wins by Andy Roddick, Venus Williams, Fish, Vavara Lepchenko, Melanie Oudin and qualifiers Shenay Perry, Brendan Evans and Taylor Dent. A few miles away in Roehampton, the second round of the ITF Grade 1 junior event was completed, with all three seeded U.S. boys advancing to the round of 16. Raymond Sarmiento (16), Mitchell Frank (11) and Denis Kudla (5) won, although all needed three sets, and Kudla needed a third set tiebreaker to down New Zealand's Ben McLachlan. Two U.S. girls remain in the hunt, with No. 14 seed Ester Goldfeld beating Akiko Omae of Japan in what must have been a thriller, 6-4, 3-6, 7-6(7), and unseeded Krista Hardebeck defeating ecilia Costa Melgar of Chile 6-1, 6-2. Hardebeck faces unseeded Ksenia Kirillova of Russia in tomorrow's third round. Kirillova surprised No. 2 seed Monica Puig of Puerto Rico 6-4, 6-4. Boys top seed Tiago Fernandes of Brazil was beaten today by Mathias Bourgue of France. The doubles competition also began today, with Kudla and Sarmiento, seeded fourth, advancing to the second round, as did Lauren Herring and Grace Min. See the LTA website for complete results. gives details on Klahn's rather late introduction to the game, his increased maturity since attending college and the likelihood that he'll return to Stanford in the fall. ESPN Rise, which is geared more to high school students, interviews Klahn about the process he went through three years ago and his advice for others still making their way along the "recruiting road," as Rise refers to it. And as mentioned previously by Doug Robson and others, Diego Moyano, the Argentine coach of Andrea Collarini, who is now training at Boca Raton, has been officially hired by the USTA as part of its Player Development staff. Wild card Lauren Davis reached the finals of the $10,000 Pro Circuit event in Mt. Pleasant SC Saturday with a 7-6(4), 7-6(1) victory over Nicole Gibbs, but fell in Sunday's championship match to No. 2 seed Petra Rampre of Slovenia 6-3, 6-2. No. 3 seeds Caitlin Whoriskey and Kaitlyn Christian won the doubles title with a 6-4, 6-2 win over Rampre and Shelby Rogers. For complete draws, see the ITF Women's website. The U.S. junior girls team came back to retain the Maureen Connolly Trophy yesterday in Eastbourne, winning both of the doubles matches to tie the score at 6-6, with the U.S. awarded the win on the basis of sets won 16-15. For a complete account of the final day's competition, see the LTA website. The ITF Junior Grade 1 tournament and Wimbledon warm-up, is underway in Roehampton, with seven U.S. boys and seven U.S. girls in the draw. Seeds Denis Kudla (5), Mitchell Frank (11) and Raymond Sarmiento (16), won their opening matches, as did Dennis Novikov and Nick Chappell. Junior Ore and Dane Webb lost their first round matches today. No. 14 Ester Goldfeld and No. 2 Monica Puig of Puerto Rico, the only U.S. girls seeded, advanced, as did qualifier Lauren Herring, Grace Min and Krista Hardebeck, who defeated the No. 16 seed, Zarah Razafimahatratra of Madagascar 6-0, 6-1. Chanelle Van Nguyen and Monica Turewicz lost their opening matches to seeded players. Aside from Razafinahatratra, the only other girls seed to lose was Orange Bowl champion Gabriel Dabrowski of Canada, the No. 6 seed, who fell to Andrea Gamiz of Venezuela 6-3, 6-3. There were quite a few surprises on the boys side, although perhaps when the surface is considered, they wouldn't exactly be called upsets. No. 2 seed Duilio Beretta of Peru lost to wild card Tom Allen of Great Britain 6-3, 6-4, and several other British boys took out seeds: wild card Liam Broady downed No. 4 seed Damir Dzumhur of Bosnia, qualifier Richard Gabb beat No. 12 seed Yasutaka Uchiyama of Japan, and qualifer James Marsalek defeated No. 13 Mate Pavic of Croatia. Fifteen-year-old Kyle Edmund, another wild card from Great Britain, was the player who defeated Ore.
For complete results and the order of play, see the LTA website. I always think of the ITF Grass Courts as an excellent and less expensive substitute for Wimbledon, which I've covered just once, in that rain-soaked year of 2007. You can tell from the videos that one of the things that sets grass court tennis apart is the lack of sound; even angry racquet tosses (very few of them, admittedly) are more like pantomimes than actual outbursts. In addition to Lipman and Mamalat, there are short videos available of finalists Shane Vinsant and Skylar Morton at the tenniskalamazoo channel on YouTube. Lauren Davis and Nicole Gibbs will meet in the semifinals of the $10,000 Pro Circuit event in Mt. Pleasant, SC on Saturday after quarterfinal victories today. Davis, a wild card, beat Tennessee's Caitlin Whoriskey 6-0, 6-2, while Gibbs, the fifth seed, had a much longer battle with Alexis King (formerly Alexis Gordon, who played for the Florida Gators) before prevailing 3-6, 7-5, 6-2. The winner of that match will meet the winner of the semifinal between Megan Falcon, the former LSU All-American, and No. 2 seed Petra Rampre of Slovenia. Whoriskey and partner Kaitlyn Christian will be play for the doubles title against Shelby Rogers and Rampre. For draws and results, see the ITF women's site (I am unable to access the results on usta.com). Next week there is a $10,000 women's Pro Circuit event in Cleveland, with Ohioans Davis and Kyle McPhillips wild card entries into the main draw. The inaugural Cleveland tournament was held last October, but was moved to June this year, taking the calendar spot previously held by Wichita. The Cleveland Plain Dealer had this article on the tournament. For complete results, see the TennisLink site. The United States and Great Britain split the four singles matches today at Eastbourne in the Maureen Connolly Trophy competition. The U.S. trails 6-4 and needs to win Saturday's two doubles matches to earn a draw. For the complete recap of today's matches, see the LTA website. 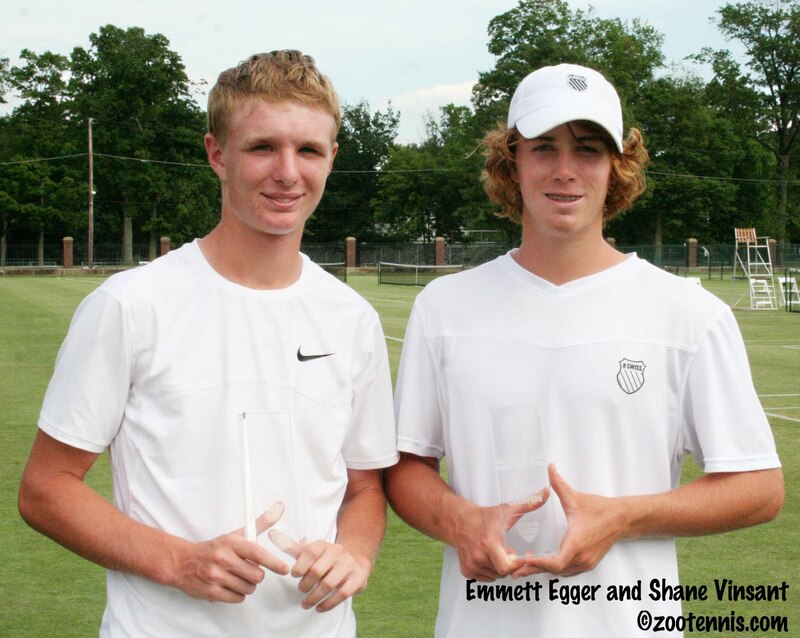 My weekly article for the Tennis Recruiting Network looks back on the ITF International Grass Courts tournament last week in Philadelphia. I will have the slideshow and videos from this event posted this weekend. 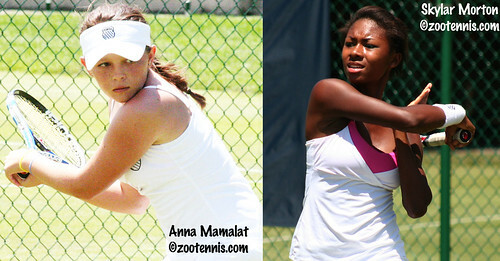 Wimbledon qualifying was completed today at Roehampton, with six U.S. players advancing to the main draw. Brendan Evans has qualified for the first time in his career, as has Jesse Witten, who has now qualified for three of the last four slams. Taylor Dent and Robert Kendrick are the other two U.S. men earning main draw spots; they have much more experience in competing at Wimbledon. Bethanie Mattek Sands and Shenay Perry are the U.S. women who earned their way into the main draw today. Seventeen-year-old Bernard Tomic of Australia will be the youngest player in the men's draw. He advanced through the qualifying for the first time in a slam, although he has played in the main of the Australian twice and French once as a wild card recipient. Guy McCrea spoke with Tomic after his second round win in the daily Wimbledon podcast. Today McCrea interviews Kendrick, Carsten Ball, Mirjana Lucic and Eleni Daniilidou. See wimbledon.org for the daily podcasts. Teams of U.S. and British junior girls are competing for the Maureen Connolly Trophy in Eastbourne, with Sloane Stephens heading the American team and Laura Robson leading the British team. Other U.S. juniors on the team are Grace Min, Chanelle Van Nguyen and Ester Goldfeld, while Great Britain has Eleanor Dean, Lucy Brown and Tara Moore. After the first day of competition, Great Britain leads 4-2. For more, see the LTA site. Not all the players asked to join the team accepted, whether because of summer classes or other obligations. The women will be coached by Jamea Jackson of Oklahoma State and Julia Scaringe of Notre Dame. The men will be coached by Chris Brandi of Baylor and Bo Hodge of Alabama. There will be camps for each group in Boca Raton, with the men training on clay June 21-24 and the women on hard courts June 28-July 1. I apologize for the tardiness of these videos and slideshow, but it's a result of the NCAAs and the Grass Courts being very close together on this year's calendar. In addition to these two YouTube videos of champions Chelsey Gullickson and Bradley Klahn, there are also short videos of Austen Childs, Jana Juricova and the men's and women's doubles finals available at the tenniskalamazoo YouTube channel. 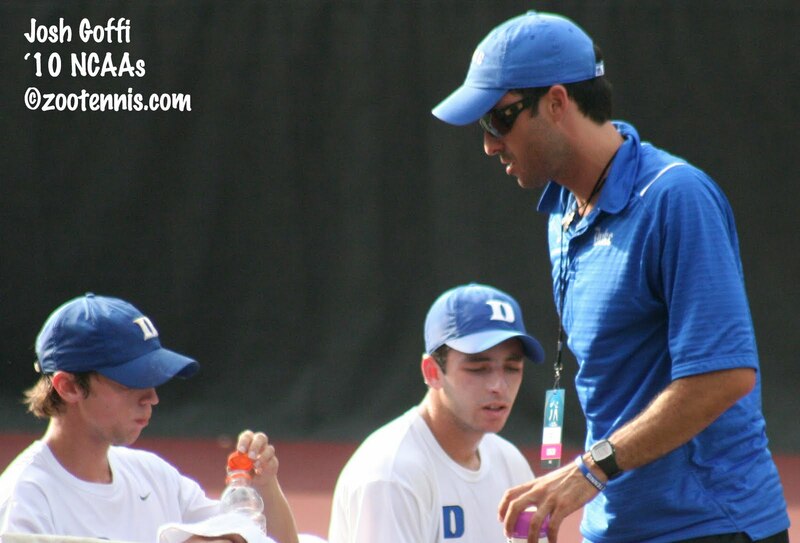 Josh Goffi, the assistant coach of men's tennis at Duke University, has been hired to lead the University of South Carolina men's program. Goffi takes over for Kent DeMars, who announced his retirement earlier this year after 26 years in Columbia. DeMars was inducted into the ITA Collegiate Hall of Fame last month in Athens, Ga. With Goffi taking the South Carolina job and Tony Bresky of Virginia taking the Cornell job, there are now two high-profile assistant positions vacant in the ACC. For more on Goffi, see the South Carolina athletic site. The ITA Coach of the Year awards were not announced at the ITA luncheon prior to the team finals, but they have now been released. Peter Smith of USC received the men's award, and Brian Kalbas of North Carolina was named the women's coach of the year. For all the ITA award winners, see the ITA website. I was disappointed to learn that the John Van Nostrand Memorial Award was discontinued by the family. In the past, it provided a small stipend to a senior men's tennis player for use in embarking on a professional career. Ryler DeHeart of Illinois, Stephen Bass of Notre Dame and Greg Ouellette of Florida were a few of the recent winners. ...the Academy will hold open tryouts this July for young persons interested in attending the McEnroe Academy starting in September. One boy and one girl between the ages of eight- and 16-years-old will be selected by McEnroe to receive a full scholarship for a year of training at the McEnroe Academy. The tryouts will be held on July 14 for boys and on July 19 for girls, beginning at 8:30 a.m. each day, at Sportime at Randall’s Island, located at One Randall’s Island in Manhattan. Late last month Scott Price of Sports Illustrated weighed in on the two McEnroe brothers' divergent player development ventures, and he has his doubts about John's suitability for the role. 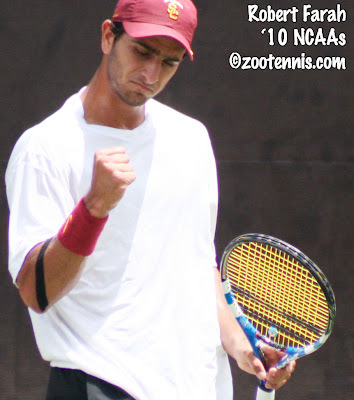 With the disappointing way his college career ended--with a rolled ankle leading to a retirement against Henrique Cunha of Duke in the quarterfinals of the NCAA individual tournament--it was a relief to see USC's Robert Farah competing in the ITF men's circuit in Venezuela as he had planned. As a qualifier, Farah won the singles championship at the $10,000 Futures tournament last week without losing a set, and won the doubles title too. He received a special exemption into the main draw of the F2 in Venezuela this week, and is also scheduled to play next week in the F3. Farah currently has no ATP ranking, but that will change soon, and there's no reason to think that he can't do what Arnau Brugues of Tulsa did in his first year on the pro circuit: win enough to raise his ranking to the point where he is in the qualifying tournaments of the slams. Jack Sock has a substantial collection of gold balls from USTA junior tournaments, but he got his first two in a USTA open event yesterday, winning the men's open hard courts in San Diego. Sock, the top seed, didn't drop a set, in fact didn't lose more than six games in any match, and in the final he defeated No. 5 seed Allessandro Ventre, an NAIA All-American from California Baptist, 6-3, 6-1. Sock and partner Mika DeCoster, the No. 2 seeds, won the doubles title 6-4, 5-7, 6-1 over No. 4 seeds Derek Miller and Michael Paradowski. Tori Kinard won the women's singles title, over UCLA's Stephanie Hoffpauir, and the doubles gold ball went to Gretchen Magers and Ros Nideffer. Sock received a wild card into the main draw at the $15,000 Pro Circuit Futures event in Davis, Calif. this week, as did Daniel McCall, Aaron Yovan and Nicholas Lopez. NCAA champion Bradley Klahn of Stanford is one of several current collegians in the main draw, and many former collegians are also among the 32 competitiors. The women are in Mt. Pleasant, South Carolina for a $10,000 clay event. Lauren Davis, Alexis King, Jeanette Draeger and Maria Belaya are the wild cards, with the final round of qualifying set to take place Tuesday. Although they played the Italian and French junior tournaments, Davis and Beatrice Capra are not playing the Wimbledon Juniors, and Christina McHale has withdrawn as well. For complete Pro Circuit draws, see usta.com. The women's Wimbledon qualifying begins on Tuesday, with only seven U.S. women among the 96 competitors. They are: Lauren Albanese, Bethanie Mattek-Sands, Julie Ditty, Julia Cohen, Shenay Perry, Lilia Osterloh and Madison Brengle. The first round of men's qualifying was interrupted by rain today, which may be a good thing, considering the U.S. men were not doing well. 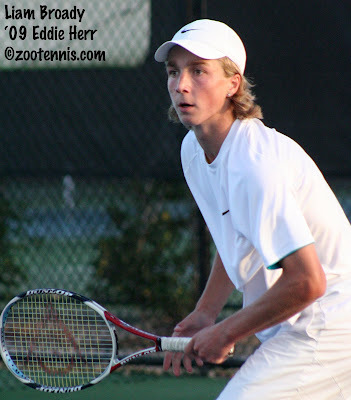 Alex Bogomolov, Donald Young, Tim Smyczek and Ryan Harrison lost, as did Lester Cook, who was beaten by Jesse Levine. There is a live blog from the qualifying, which is held at Roehampton, not the AELTC, on the Wimbledon website, and Guy McCrea is also doing podcasts for Wimbledon radio. His first one can be found here. 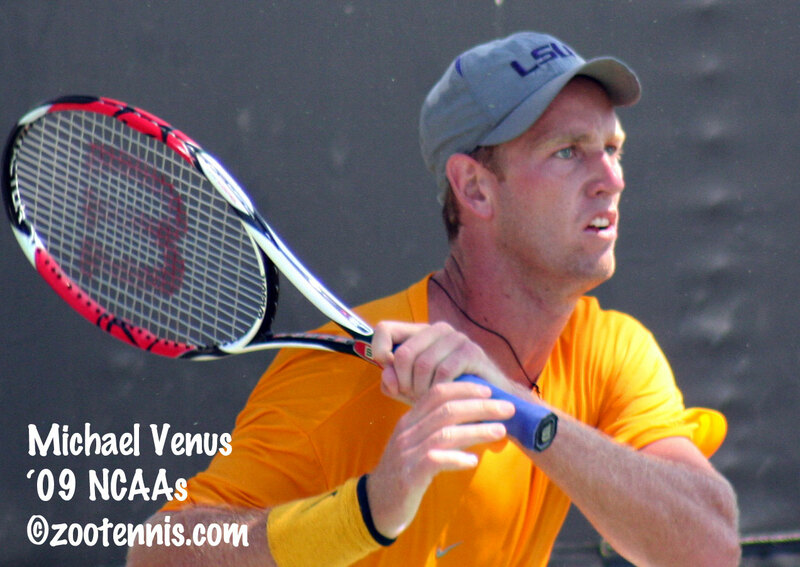 Former LSU All-American Michael Venus captured both the singles and doubles titles Sunday in the $15,000 Pro Circuit event in Loomis, Calif. The eighth-seeded Venus, who completed his collegiate eligibility last year, defeated Dimitar Kutrovsky, who just ended his college career at the University of Texas, 7-6(4), 1-6, 6-3 in the final. Venus and Marcus Daniell of New Zealand, seeded fourth, won the doubles championship with a 6-4, 6-4 win over No. 2 seeds Nima Roshan of Australia and Jose Statham of New Zealand. New Zealand was to have named its Davis Cup team last week in preparation for next month's tie with Pakistan, but according to this New Zealand Herald article their top two players have not committed. Venus is mentioned among the possibilities, which would be complicated for all parties involved, because he is playing under the USA flag right now. NCAA finalist Austen Childs is also among those mentioned as potential Davis Cup players for New Zealand. In the women's $25,000 Pro Circuit event in El Paso, Texas, unseeded CoCo Vandeweghe won her second straight tournament, defeating top seed Ryoko Fuda of Japan 6-2, 6-1 in today's final. Angela Haynes and Ahsha Rolle won the doubles title. For complete draws, see the Pro Circuit page at usta.com. In the sectional qualifying for the US Open National Playoff, Kentucky's Eric Quigley won the Midwest section's men's tournament, with 15-year-old Evangeline Repic of Ontario, Canada taking the women's. The Hawaii-Pacific titles went to Ikaika Jobe, the former Boise State player, and Maureen Diaz, who played her college tennis at USC. The Middle States and Southern tournaments are underway now, and in the Middle States, juniors Michael Zhu and Ronit Yurovsky are still in contention, as is Josipa Bek, who plays for Clemson. In the Southern, Austin Smith has reached the men's quarterfinals, and Alexandra Clay, the Alabama recruit, is in the women's final. Wimbledon men's qualifying begins on Monday, with 16 U.S. men in the 128 draw: Taylor Dent, Ryler DeHeart, Alex Bogomolov, Kevin Kim, Donald Young, Michael Yani, Jesse Levine, Lester Cook, Alex Kuznetsov, Ryan Sweeting, Robert Kendrick, Brendan Evans, Bobby Reynolds, Jesse Witten, Tim Smyczek and Ryan Harrison. Yani plays US Open junior champion Bernard Tomic of Australia and Kendrick plays 18-year-old Filip Krajinovic of Serbia. Harrison's first round opponent is former world No. 1 junior Ricardas Berankis of Lithuania. For the complete qualifying draws, see wimbledon.org. 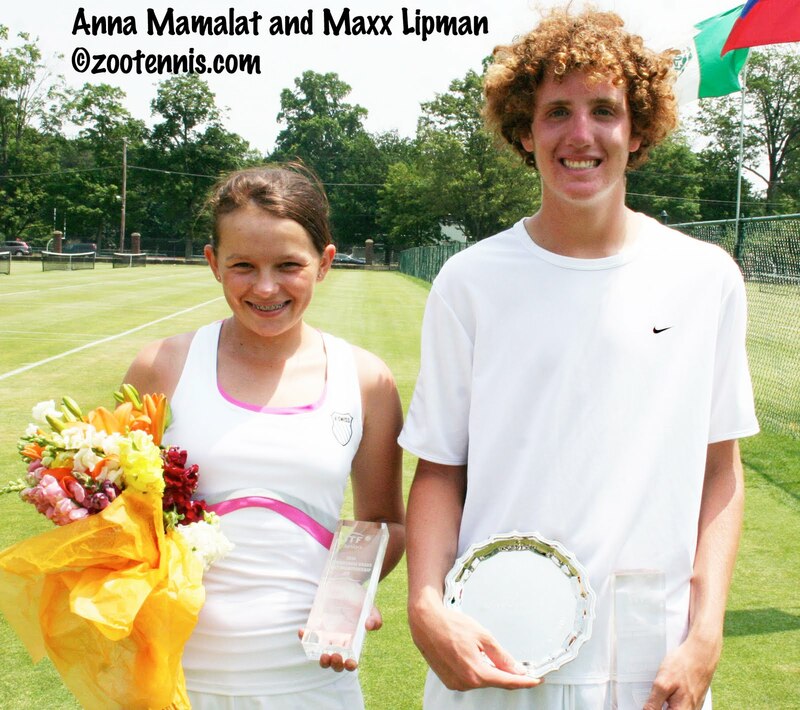 Whether it was home cooking, family experience or simply games that work well on grass, Anna Mamalat and Maxx Lipman made their advantages work for them Saturday, claiming singles titles at the ITF International Grass Court Championships at the Philadelphia Cricket Club. Mamalat, who lives 30 minutes from the tournament site, showed another side of her game in rolling past unseeded Skylar Morton 6-2, 6-0. In his first trip to the finals, the 15-year-old Lipman accomplished what his older brother Ryan could not in the championships matches of 2007 and 2008, earning the title with a 6-1, 6-4 victory over No. 3 seed Shane Vinsant. Mamalat, 16, defeated No. 8 seed Kyle McPhillips in Friday's semifinal in three lengthy sets that saw both players use hundreds of slices and drop shots. In Saturday morning's final, her opponent, the conditions and advice from her coach combined to produce a different game style. With the breeze gusting and swirling during the match, Mamalat believed she needed to hit the ball flatter and finish points more aggressively. Breaking Morton in the first game of the match, Mamalat was able to swing freely, playing from ahead. "I knew I had to stay calm and get a good start," said Mamalat, who admitted to some nervousness at the start of the match. "The conditions weren't very good, and I think she missed a little more, so I just tried to take my chances." Morton admitted that Mamalat's aggressive play caught her off guard. "I saw her match yesterday, when she was slicing, but today she was hitting through the ball and hitting pretty deep," said Morton, also 16. "It was hard for me to come in. But I was making a lot of errors, too." Mamalat got a second break to take a 5-2 lead and, saving a break point in the next game, finished off the set. Morton had lost her first set in the semifinals to top seed Lauren Herring by a 6-1 score, so she could not be counted out of the match, but luck was not on her side as she attempted a similar comeback. Serving at 30-40 in the first game of the second set, Mamalat's racquet barely caught the ball on a return, but the shot fell over the net for a winner. Trailing again, Morton tried for more on her shots, but Mamalat was able to handle anything Morton threw at her. Mamalat celebrated briefly with a dozen or so friends who had come to watch her, but because the match was so short, her family didn't see any of it. With older brother Daniil, a Marquette recruit, graduating from high school Saturday morning, her parents and two brothers didn't arrive until after the match. They were able to see her presented with the winner's trophy however. "It feels great," said Mamalat, who had played the tournament the previous two years. "I've never won such a big event before." The boys final followed a similar pattern when it began shortly after noon on Saturday. Vinsant was broken to start the match, and Lipman kept the pressure on by playing aggressively. Leading 3-1, Lipman broke Vinsant at love, and in the next game, hit two aces and a backhand winner to take a 5-1 lead. Vinsant stayed committed to the serve-and-volley game, but Lipman returned well, and rarely missed a passing shot, or as an alternative, a lob. "I was super nervous before the match," said Lipman, who received a wild card into the tournament. "So it was great to get the break, knowing that whatever happened in my service game I was tied or up two games. So I played kind of free and it showed. My returns were on fire the whole match." Vinsant, who had lost the first set to Mitchell Polnet in Friday's semifinal, never felt he was out of contention. "I always thought I was in it, the whole match," said Vinsant, 16. "But he was hitting the returns a little bit harder than my other opponents, putting a little more pressure on me. I feel like normally though, I wouldn't miss a lot of those volleys. But he played well." The second set was much closer from the start, with holds from each player until Vinsant was broken at love in the sixth game. After holding for 5-2, Lipman admitted that his nervousness reappeared, and serving for the match at 5-3, he double faulted at 15-30 to give Vinsant his first two break points of the match. Vinsant converted on the second one, volleying behind Lipman, but despite that break, Lipman was still confident. "I knew the way I had been returning, I could definitely break him," Lipman said. "I knew I could give myself a great chance to win the match on his next service game." Lipman had his first opportunity to do that at 30-40, but Vinsant came up with a rare ace to get it to deuce. A game point for Vinsant came and went when he missed a volley, and a Lipman return at his feet on the next point gave Lipman his second match point. When Vinsant's first volley caught the tape, it was over, with the Lipman name going on the list of singles champions for the first time. "When I talked to Ryan yesterday, he was just really happy for me," Lipman said of his older brother, who played No. 1 singles for Vanderbilt in the recently completed college season. "He was excited for me and said I hope you win it--do something I couldn't do. It feels good to go home and show him the trophy." Lipman is still one sportsmanship trophy short of his brother, who won it both in 2007 and 2008, but he hopes to return to play at the Grass Courts next year, perhaps prior to a trip to Wimbledon. Zoe Scandalis of San Diego, California was the winner of the girls sportsmanship trophy. Long three-set matches are an anomaly at the International Grass Courts, but you wouldn't know it from Friday's singles semifinals. All four semifinals went the distance on a picture-perfect day at the Philadelphia Cricket Club, and except for the victory by No. 3 seed Shane Vinsant, the decisions went to the underdogs. Wild card Maxx Lipman lost his first set of the tournament to No. 6 seed Brandon Burke of Jamaica, but regrouped for a 6-4, 1-6, 6-0 win, while Vinsant needed a comeback to prevail over unseeded Mitchell Polnet 4-6, 6-3, 6-4. In the girls semifinals, unseeded Skylar Morton spotted top seed Lauren Herring a quick first set, but came back for a 1-6, 6-3, 6-2 win to earn her place in the final against another unseeded player, Anna Mamalat. Mamalat withstood a third set comeback by No. 8 seed Kyle McPhillips to claim a 6-3, 3-6, 6-4 victory. Lipman let an early break in the first set slip away with a flurry of unforced errors, but he managed to get the break right back to take a 4-3 lead, then held his next two service games for the set. Burke took a lead in the second set, serving well for a 1-0 lead, then outlasting Lipman in a seven-deuce game to go up 2-0. Burke kept rolling, taking a 5-0 lead, but even after falling that far behind, Lipman wasn't conceding the set or discouraged about the remainder of the match. "There were a lot of close games that didn't go my way," said the 15-year-old from Nashville. "I tried to stay positive--I knew I could win those games in the third, and I did. It was good to see me bounce back from a rough second set, cut down my errors and play a good set." Lipman took control in the third set to earn a spot in the finals, matching his older brother Ryan's accomplishment in 2007 and 2008. Against Vinsant, Polnet was able to make the only break of the first set hold up, but despite dropping the first set, Vinsant didn't blame it on a slow start. "I didn't really start that slow," said the 16-year-old from Texas. "He's really good, especially on grass. I've never played someone on grass who could pass that well. I figured out a few things that helped me, but I wouldn't say I started slow. He played well." In the second set, it was Vinsant who got the only break, in the second game, and despite needing four set points serving at 5-3, it was enough. Approaching more often to Polnet's forehand helped him neutralize Polnet's passing shots, and a few volley errors started to creep into Polnet's game, but the outcome was in doubt right up until the last point. After trading breaks with Polnet early in the third set, Vinsant got another break at 4-4, but several good returns gave Polnet a break point at 30-40 with Vinsant serving for the match. Polnet hit a good lob on that point, but Vinsant hit an even better overhead while backpeddling to get it back to deuce, and two volley winners later, he had reached the final. "I've been struggling a little bit lately, the past six months, so it means a lot to have a good tournament," said Vinsant, who is playing the Grass Courts for the first time. "I'm trying to get some momentum again." Vinsant and Lipman haven't played before in singles, although they did play in the second round of doubles earlier in the week. The girls final between Mamalat and Morton will be their first meeting since the 12s, a meeting that didn't look likely when Morton dropped the first set to Herring in very short order. "She played really well," said Morton, a 16-year-old from suburban Washington DC. "And I wasn't constructing my points as well. The points were over really fast, so I tried to slow it down, focus on neutralizing the return and move in myself." In the second set, Herring was broken at 1-1 in a five-deuce game, with two double faults contributing to the loss of that game. Morton began to read Herring's serve better as the match wore on, and picked up the pace on her ground strokes as well. In the third set, Herring was broken in the fourth game, with several of the chair umpire's calls increasing her frustration. Morton kept playing aggressively, and too many errors from Herring kept her from getting the break back. The other girls semifinal was a completely different style of game, with both Mamalat and McPhillips slicing seemingly 80 percent of the time and hitting drop shots the other 20 percent. So committed were they to their grass games, that even drop shots when returning serve were used to keep the other off balance. McPhillips had difficulty getting her first serve in play, and Mamalat went after the returns on the second aggressively, taking a 4-0 lead before McPhillips started to find her game. Mamalat stopped a run of three straight games by McPhillips with a hold, then broke McPhillips again to take the opening set 6-3. In the second set, McPhillips began to serve more effectively and decrease her errors, but it took plenty of long points before she could claim the second set 6-3. It was Mamalat who started strongly in the third set, breaking McPhillips in the opening game and again in the fifth game, to build a 5-1 lead. McPhillips again strung together three straight games to make it 5-4, leaving Mamalat with just one chance to convert what had seemed an insurmountable lead. At 30-30, Mamalat got a fortunate net cord winner to earn her first match point, but McPhillips saved that with a brilliant backhand dropshot. A backhand winner on the next point gave McPhillips a game point to pull even, but Mamalat saved that with a backhand winner of her own, and when McPhillips made a rare error on the next point, Mamalat had match point No. 2. This time she converted, hitting a two-handed forehand winner to reach her first ITF final. "I knew I had to just stay calm and not worry about the last point, worry about the next point and go on from there," said the 16-year-old Mamalat, who despite living in Philadelphia, said she doesn't practice on grass. "I knew I had to stay focused. I knew she wasn't going to give up, so I had to keep fighting." Mamalat admitted that she didn't expect to be in the final when the week started, but she's enjoying her run and is determined to continue using her slice and drop shot Saturday. "And get my first serve in," she said. The girls final will begin at 11 a.m. Saturday, with the boys final to follow. Only one of the doubles finals scheduled for Friday afternoon was played. In the girls doubles, the No. 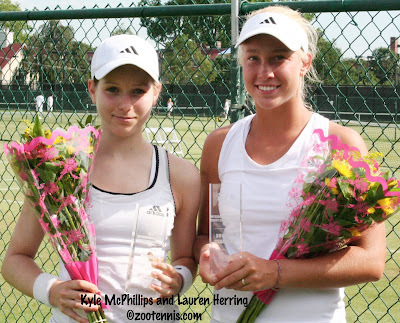 2 seeds Herring and McPhillips were awarded the title when top seeds Kelsey Laurente and Hai-Li Kong could not play due to a conflict with a scheduled flight. In the boys doubles, Emmett Egger and Vinsant, the No. 2 seeds, claimed their first tournament win as a team, defeating unseeded Anthony Delcore and Vikram Hundal 6-2, 7-6(4). A team now for more than a year, Egger and Vinsant have reached final after final, including Kalamazoo, but until today, had not won a title together. "After like eight finals, we'd never won one, so after the first set, we were super intense," said Egger. "We knew we couldn't let down, even for a second, because we wanted to get it done." "We practice together all the time, so our communication is good," Vinsant said. "We've figured some things out that helps us." Just a quick post to direct you to my story today at the Tennis Recruiting Network, which is my conversation with Lauren Herring about her recent commitment to play for the University of Georgia in 2011. Wild card Maxx Lipman knows he has big shoes to fill, with his older brother Ryan having reached both the singles and doubles finals at the ITF International Grass Courts in 2007 and 2008. But the size 13 shoes of the 15-year-old from Nashville have established an impressive footprint of their own at the Philadelphia Cricket Club. In his first year competing at the tournament, Maxx earned a semifinal berth in singles with a 7-6(2), 6-3 victory over top seed Bjorn Fratangelo Thursday morning. The match resumed from Wednesday's rain-out at 4-3 in the first, and it continued to be anybody's match until the tiebreaker. Lipman seemed to continually surprise Fratangelo with his ability to track down an overhead or reflex a volley, and the occasional bad bounce seemed to disrupt Fratangelo's concentration more than it did Lipman's. "I just kept pressing, kept making him hit a lot of balls," Lipman said. "He struggles moving sometimes--he likes to set up--so I just tried to keep him moving. I used a lot of slices, would come to the net on them, and he had a lot of trouble passing me. I tried not to let the nerves get in the way, and it worked." Lipman said he would put the victory at the top of his list of big wins. "It's definitely the biggest win I've ever had," he said. "It would have been nice if it had been in the finals, but I still have a few more matches to go. It's definitely the biggest singles win I've ever had." In Friday's semifinals, Lipman will play No. 6 seed Brandon Burke of Jamaica, who put an end to the run of qualifier Richard Del Nunzio 7-5, 6-3. In the bottom half's semifinal, No. 3 seed Shane Vinsant will play unseeded Mitchell Polnet. Vinsant took a very long and tough 6-4, 6-4 decision from unseeded Evan Song, while Polnet, from nearby Bucks County, continued his outstanding play, taking out No. 5 seed and 2009 semifinalist Emmett Egger 6-4, 6-2. In the girls quarterfinals, top seed Lauren Herring overcame the loss of the first set to unseeded Jennifer Kellner, earning a 3-6, 6-3, 6-1 victory. Down 5-2 when play resumed, Herring wasn't able to turn the match around immediately, but at 2-2 in the second set, she noticeably elevated her level of play. Holding for the first time in the set to take a 3-2 lead, Herring didn't lose her serve the remainder of the match. Not only was she getting free point from her first serve, but she eliminated the unforced errors that had caused her trouble in the first half of the match. Finding a particularly effective short angle forehand that produced several winners on key points, Herring also approached the net often, pressuring Kellner into missing passing shots. Herring will play unseeded Skylar Morton in the semifinals. Morton defeated unseeded Zoe Scandalis 6-3, 7-5 in the quarterfinals. No. 8 seed Kyle McPhillips had already won the first set from unseeded Spencer Liang prior to Wednesday's rain, and when the two returned to the court Thursday, there was no change in momentum, with McPhillips rolling to a 6-1, 6-1 win. McPhillips' opponent in the semifinals will be unseeded Philadelphian Anna Mamalat, who defeated unseeded Brooke Austin 7-5, 6-2 in the quarterfinals. Mamalat has used her drop shot effectively all week, and today was no exception, as she often caught Austin waiting at the baseline for a two-handed forehand that never arrived. The girls doubles finals will feature the top two seeded teams. No. 1 seeds Hai-Li Kong and Kelsey Laurente defeated the unseeded team of Kellner and Mamalat 6-2, 7-5 in one Thursday afternoon's semifinal. They will play No. 2 seeds Herring and McPhillips, who cruised past unseeded Spencer Liang and Leighann Sahagun 6-2, 6-2. McPhillips won the doubles title last year, teaming with Chanelle VanNguyen. The boys doubles championship will be decided between unseeded Anthony Delcore and Vikram Hundal and No. 2 seeds Egger and Vinsant. Delcore and Hundal, who have yet to be taken to a match tiebreaker, downed Christian Lee of Malaysia and Gino Meeuwsen of the Netherland Antilles 7-5, 6-3. Egger and Vinsant, who have also avoided the match tiebreaker, defeated unseeded Daniel Khanin and Harrison Richmond 6-4, 6-2. The boys semifinals will begin at 11 a.m. on Friday. Complete draws can be found at the TennisLink site. The NCAA Division I individual championship slideshow, featuring all quarterfinalists in singles and semifinalists in doubles, is coming soon. If any of the players at the ITF Grass Courts at the Philadelphia Cricket Club are hoping to compete someday at Wimbledon, they were presented with a valuable preview of the weather disruptions they're likely to encounter Wednesday. Sprinkles that began around 9 a.m. stopped long enough to allow a few games to be played before one three-minute disruption, followed by another resumption long enough to require a warm-up, then a final suspension around 11:20 a.m., when the rain began to fall steadily. With radar showing no breaks for the remainder of the day, all eight matches, most of which were in the middle of the first set, will resume on Thursday at 11 a.m., with the doubles semifinals to follow. The above photo shows Brooke Austin after a slip on the grass. Although this may have been related to moisture, we've seen plenty of other tumbles, even during the two sunny days that began the week. With my unexpected free time this afternoon, I hope to finish my NCAA Team Championship slideshow and get it posted this evening.